Zoonotic disease results from viruses and bacteria, also known as pathogens, that move between species. Zoonotic disease exists as a single infection, or spillover, between animal and human. It’s in the news as an outbreak when several people in a region are ill due to a shared source or as an epidemic when a widespread occurrence of the same illness is spreading by multiple sources. A pandemic occurrence affects an entire country, continent or the planet. Here are other key concepts behind zoonotic disease and control. 1. Myth: Zoonotic disease is about zoos. Reality: Words with zoo- refer to the study of animal biology, or zoology. Zoonotic disease is about much more than illness in zoo animals. 2. Myth: Zoonotic disease only occurs in tropical places. 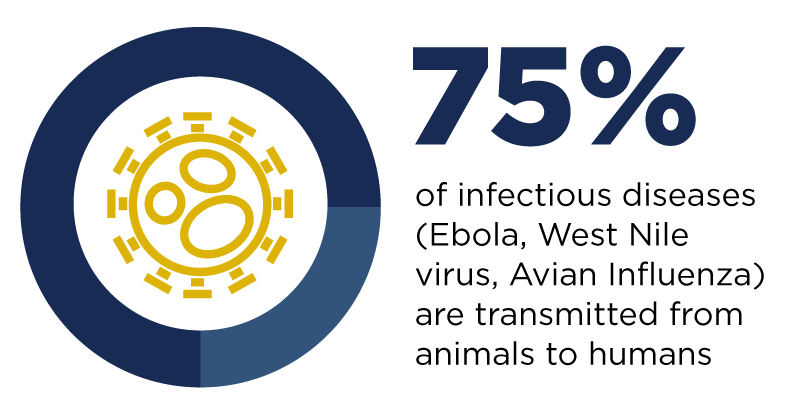 Reality: Zoonotic disease is part of daily life across the globe. Zoonotic disease can be transmitted in your home. There are many infectious diseases that move between pets and people, such as Salmonella and ringworm. Zoonotic disease can be transmitted in your region. Your local farmers constantly monitor and treat diseases in livestock, like strains of avian influenza, that could infect consumers or other animals. Zoonotic disease can be transmitted in the wild. Disease spreads in natural landscapes where people and animal activities overlap. Researchers have analyzed, for example, where people and primates share disease. Overall, our land use and lifestyles make disease transmissions common. We build our homes and neighborhoods into wildlife habitat, and we use mass transit to travel for leisure or work and to transport animal products far from their origin. Nearly everyone is affected by the movement of and exposure to pathogens. 3. Myth: Preventing a global disease outbreak is overwhelming and hopeless. Reality: Simple steps like washing your hands frequently and avoiding insect bites are important in preventing illness and its spread. There are also more complex strategies that situate laboratory, policy, environmental and other expertise and tools in critical places. With surveillance, training and collaboration, communities and scientists like Jonna Mazet with the One Health Institute at the UC Davis School of Veterinary Medicine are building the capacity to protect global health worldwide.